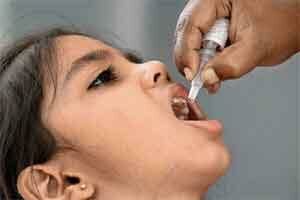 New Delhi, Jan 16 : With India remaining polio free for five years now, the government today said that it plans to switch to bivalent Oral Polio Vaccine (OPV) from its present trivalent version in “some months” even as President Pranab Mukherjee launched the country wide Pulse Polio programme for 2016 on the eve of National Immunisation Day. Union Health Minister J P Nadda who was present when the President launched the programme by administering polio drops to children at the Rahstrapati Bhawan, said that the switch will be done in a globally synchronized manner. Trivalent OPV contains live and weakened versions for all the three types (1, 2 and 3) of wild polio while the bivalent vaccine will contain type 1 and 3. Type 2 of wild polio virus has been eradicated worldwide long time back. India has already introduced injectable Inactivated Polio Vaccine (IPV) into its routine immunization programme along with oral polio vaccine (OPV) from November last year. In the first phase, IPV has been introduced in Assam, Gujarat, Punjab, Bihar, Madhya Pradesh, and Uttar Pradesh. “We are also planning for switch from trivalent OPV to bivalent OPV in some months in a globally synchronized manner,” Nadda said. Meanwhile, under the Pulse Polio programme for 2016, around 17.4 crore children under five years will be given polio drops. “Polio-free status for five years is a treasure for all of us. India has been now validated for Maternal and Neonatal Tetanus elimination in May 2015 well before the global target date of December 2015. “This is a monumental achievement in the country’s efforts to achieve universal healthcare and address health inequities,” Nadda said. The Health Minister noted that to provide double protection to children and securing gains of polio eradication, government has introduced the IPV into its routine immunization program along with oral polio vaccine.